WEST LAFAYETTE, Ind. – Researchers have discovered that rising temperature induces key changes in the dengue virus when it enters its human host, and the findings represent a new approach for designing vaccines against the aggressive mosquito-borne pathogen. The researchers found that the dengue virus particles swell slightly and take on a bumpy appearance when heated to human body temperature, exposing "epitopes," or regions where antibodies could attach to neutralize the virus. The discovery is significant because it could help to explain why vaccines against dengue have been ineffective, said Michael G. Rossmann, Hanley Distinguished Professor of Biological Sciences at Purdue University. Scientists have been designing vaccines targeting the virus's smooth appearance found at the cooler temperatures of mosquitoes and ticks. "The bumpy form of the virus would be the form present in humans, so the optimal dengue virus vaccines should induce antibodies that preferentially recognize epitopes exposed in that form," Rossmann said. The findings are detailed in a research paper appearing online this week in Proceedings of the National Academy of Sciences. The researchers used a technique called cryo-electron microscopy to see the three-dimensional structure of the virus at temperatures ranging from 28-37 degrees Celsius (37 degrees Celsius is 98.6 degrees Fahrenheit, or human body temperature). Findings showed that the virus has a smooth appearance while at the cooler temperatures found in mosquito or tick vectors, but then it morphs into the bumpy form at warmer temperatures before fusing to the host cell and delivering its genetic material. "These findings were a big surprise," said Richard J. Kuhn, professor and head of Purdue's Department of Biological Sciences and director of the Bindley Bioscience Center. "No one expected to see the virus change its appearance as it moves from the mosquito to humans." The paper was co-authored by postdoctoral researcher Xinzheng Zhang; lab manager Ju Sheng; postdoctoral researcher Pavel Plevka; Kuhn; Michael S. Diamond, a researcher at Washington University School of Medicine; and Rossmann. Findings also could apply to related infections in the flavivirus family, which includes a number of dangerous insect-borne diseases such as West Nile, yellow fever, tick-borne encephalitis and Japanese encephalitis. Dengue (pronounced DEN-gē) is a leading cause of serious illness and death among children in some Asian and Latin American countries, causing 50 million to 100 million infections per year. Globally, dengue has grown dramatically in recent decades, placing about half the world's population at risk of infection. The researchers determined that the bumpy form of the virus is more efficient at infecting mammalian cells. The team was able to measure the virus's infectivity using a laboratory procedure where cells are infected in a culture dish. The bumpy shape is an intermediate stage before the virus becomes unstable, releasing its genetic material. The virus is made of subunit molecules that separate when the virus particle expands into its bumpy form, revealing exposed membrane surfaces between the subunits where antibodies might bind. 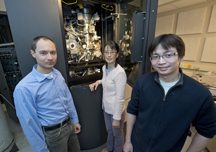 The work is funded by the National Institutes of Health and Purdue through university support for a structural biology electron microscope facility. We report on a conformational transition of dengue virus when changing the temperature from that present in its mosquito vectors to that of its human host. Using cryo-electron microscopy, we show that although at room temperature the virus has a smooth surface, a diameter of ~500Å and little exposed membrane, at 37ºC the virions have a bumpy appearance with a diameter of ~550Å and some exposed membrane. The bumpy structure at 37ºC was found to be similar to the previously predicted structure of an intermediate between the smooth mature and fusogenic forms. As humans have a body temperature of 37ºC, the bumpy form of the virus would be the form present in humans. Thus, optimal dengue virus vaccines should induce antibodies that preferentially recognize epitopes exposed on the bumpy form of the virus.